A postdoctoral position in neuroscience is available immediately at the Virginia Commonwealth University (VCU) School of Medicine in the laboratory of Kurt F. Hauser. The candidate will study fundamental mechanisms underlying glial dysfunction and synaptodendritic injury in the striatum and hippocampus following opioid and HIV exposure. The candidate will have the opportunity to integrate basic cellular and molecular approaches aimed at elucidating how opioid abuse exacerbates glial dysfunction and synaptodendritic injury in neuro-acquired immunodeficiency syndrome (neuroAIDS). The candidate will join a team that utilizes multi-disciplinary cell signaling, pharmacological, immunological, neurophysiological (including optogenetics), and behavioral strategies to explore opioid-HIV interactions in murine (in vitro and in vivo) and human (in vitro) models. 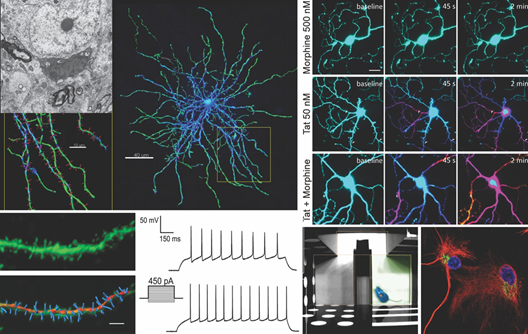 Cutting-edge imaging facilities, which include structured illumination and multiphoton microscopy are available. A Ph.D., M.D. and/or equivalent doctoral degree with experience in cellular and molecular neuroscience or neuropharmacology is essential. Additional experience in neurophysiology and/or optical physiology (genetically-encoded voltage and calcium indicators) is highly desirable. The candidate will be provided with significant training in those disciplines with which they are less familiar, as well as significant mentoring to facilitate their transition to an independent research career. Interested individuals are encouraged to forward a curriculum vitae, a list of three references, and a statement of research interests and career goals to Kurt F. Hauser, Department of Pharmacology & Toxicology, Institute for Drug & Alcohol Studies, VCU School of Medicine, Molecular Medicine Research Building, 1220 E. Broad St., Richmond, VA 23298 (email:kurt.hauser@vcuhealth.org).